Wow. It’s August already. It’s been almost a whole year since I told you Daddy passed away on 8-22-16. I had said that soon I would write a longer post about that. Several times I have thought about this post. Just couldn’t seem to get started. Even now, I’m certain that it’s going to take me a few sessions of sitting down at the keyboard to complete it. But, for tonight, 8-6-17, I will get a start. This story really begins in 2010. In April of that year my mother was diagnosed with a rare, aggressive lymphoma. What followed was a grueling regimen of chemo, ending with a stem cell transplant, and anyone that has been through one themselves or on the sidelines with a loved one, knows the full extent of what that means. To say it’s harsh would be an understatement. I was amazed at the strength and endurance of my mother during those days. In the midst of her battle, my father’s battle began. That’s when his Alzheimer’s began to rear it’s ugly, ugly head. He was so stressed and distraught at the thought that he may be losing my mom, his beloved wife and companion from the time they had barely entered their 20’s, now in their early 70’s, that his slipping mental capacity began to show. It was a challenging time for my brother and for me. We were holding down jobs while trying to make trips back and forth to the hospital for mom, and make sure Daddy was ok, which meant trying to keep him from attempting to set out to Amarillo by himself when mom was in the hospital there, an hour away. I was staying nights at their house in Pampa, driving to my job in Borger for a portion of the day, and then on to Amarillo to check on mom in the hospital, and then back to Pampa to spend the nights with Daddy. At some point in this, I made an appointment at their family doctor for Daddy, and my brother took him. The doctor began to do the evaluation on him for Alzheimer’s and my father realized what was happening, and oh boy did he get mad at us. It was awful. His little sister, my precious Aunt Carla, had been able to come and help for part of this time, and she caught an earful about us, and how we were conspiring against him. She did her best to defend us. It hurt so much to have to be the “bad guys” when all we were trying to do was help him and help mom. By this time, it was October of 2010. Mom was a strong little trooper, and she fought her way through to the other side of the stem cell transplant and followup chemo treatments and has been in remission to this day. God bless her, she came through to spend her recovery becoming a constant caretaker for Daddy as his mental abilities began the steady downhill decline that comes with Alzheimer’s. We were so ready to get to the holidays and spend them in celebration of her, and her survival, but life had other plans for our family. Mom’s favorite holiday was Thanksgiving, but by the time November and the holiday came, she was still not feeling well from all she had been through, and eating still wasn’t much fun as she had lost much of her sense of taste from the treatment to save her life. Just before Christmas, as many of you who have followed my blog from the beginning already know, my husband of 14 years, Greg, was diagnosed with a benign meningioma tumor in his brain. The tumor was successfully removed on Feb. 2, 2011, however there were complications, resulting in more surgeries, more complications, and ultimately his death on May 22, 2011. This was very stressful on my whole family, including Daddy. It also put me in a position of barely being able to keep my own head above water there for awhile, let alone be much help to mom. I can only imagine, looking back, how difficult those days were for her. I know now there had to be a lot that she kept from me, not wanting to cause me any more distress than I was already under. As the years rolled on, and we all moved forward, we knew Daddy was slipping, but he and mom seemed to be managing, really pretty well, on their own for quite some time. Mom quit driving completely after her diagnosis. She was never a confident driver anyway, and would only drive there in Pampa, to church and back, the grocery store, Walmart, etc. What we began to realize, over time, was that Daddy was doing the driving and Mom was telling him how to get there. And, that was working out just fine until the day Daddy lost his wallet sometime in the fall of 2014. They went to the local DPS office to report his lost driver’s license. It didn’t take long for the staff there to realize there might be a problem. That was the end of driving for Daddy. Honestly, we were relieved, as my brother and I had just began to to see that he had reached a point where we knew that soon we were going to be needing to figure out how or what to do to get him to stop driving. And now, it was out of our hands. It wasn’t us that were the bad guys this time. It was those “blankity blanks” at the DPS office Daddy was mad at. Not us this time. Yay. Thus began the search for a new home for them where I live, an hour away from them. My brother also agreed to relocate, to be able to live with mom and daddy. However, housing was scarce due to the oil boom going on then. We were able to get a new house that was still under construction, under contract. But, it would be months still before they could move in. What a challenging time that was. But, we managed. Not completely on our own, but with the help of some local friends that could swing by and check on them, and help us get them groceries if we couldn’t get there in time due to weather, etc. It was also during this time that we discovered a secret Mom had tried to keep from us. Daddy had began to have fits of rage, and at least some of those, if not all, were directed at her. It was very worrisome. Mom insisted she was fine and she was able to handle the situation, and refused any other options at that time. We were finally able to move them the latter part of May, 2015. After a major upheaval in his life and routine, Daddy really began to decline even faster. It wasn’t long before he couldn’t identify us as his children, or even worse in a way, his beloved grandchildren. It’s just pretty darn hard when your parent can’t identify you as their child. Mentally you know and understand why, but in your heart, damn…that just hurts. You know how confused and scared your parent is, and you can’t even comfort them as their child. You become just another source of confusion to them. There were times Daddy would say, “I should know who you are”, or “I think I’ve seen you before”. My mom, brother and I managed for almost another year to keep Daddy “at home” before he reached a state that we simply could not manage on our own any longer. Daddy’s constant need for Mom’s help and attention really began to take a toll on her. His violent outbursts were more frequent and always unpredictable, and he lashed out at my brother (who moved in with them to help) and my mother. Daddy was still pretty strong physically and capable of really hurting Mom if he got ahold of her just right. Once he did grab a hold of her around the head, face and neck, and luckily my brother was right there to intervene. I can only imagine what might have happened if they had been alone. Afterwards, on some level he recognized hurting her and told me to have him put in jail, and then would confusedly ask me “what is going to happen to me? Am I going to go to jail?” Shortly after, Mom finally reached the place of saying “we have to do something. I can’t do this anymore”. Aside from the aggressiveness, He kept her up all night getting up and down, back and forth to the bathroom, etc. He couldn’t find it himself, only a few feet from his side of the bed. She was utterly exhausted. It was so emotionally draining for her, as well. It was for all of us. In between the violent incidents, he was docile and very sweet. Daddy, but not Daddy. It was sometime in March that we moved him into the local nursing home, that was just down the street from their house. We were hopeful that it would work out, and it was so easy to visit and get mom down there to see him. Our hopes were short lived. Daddy was behaving aggressively toward the staff at times, just like at home, and in April, it was discovered that he had a blockage in his bladder. He had to be taken to a hospital four hours away for an emergency bladder surgery. In the hospital, it fell on my brother and I to restrain him when he would become agitated, to keep him from injuring himself by pulling tubes out. The hospital was using restraints, and soon we learned that every time they put restraints on him, he would have to be held another 24 hours before they could release him back to a nursing facility. He had to be restraint free for 24 hours. Well, that was not going to happen, so we finally said no more, and simply would not allow it. My brother and I would take turns holding his hands, while trying to avoid getting bitten. It was horrible. We finally managed to get him released and transported back to our local nursing home by an ambulance service that we hired. That lasted about a week and he bit one of the nurses at the nursing home. That got him admitted to a geriatric mental health hospital an hour away, so that they could work on leveling out his aggressiveness with medications. Our understanding was that they were usually successful in getting them to a manageable level and that he would be re-evaluated for admittance back to the home. However, that is not what happened. They discharged him and were done. They told my brother we could come pick up his things at our earliest convenience. 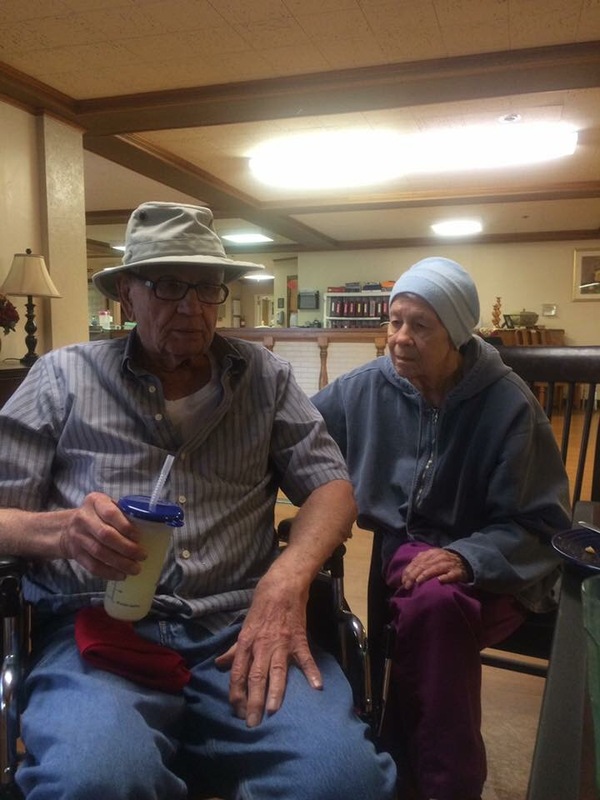 They said it was their understanding that the nursing home in a small community about 15 minutes away, with an Alzheimer’s wing, was willing to take him. After right at a month long stay, the psychiatric hospital had him, for lack of a better description, medicated into a manageable state, and the social worker began the process of trying to get him admitted to that nursing home, with no success in getting phone calls returned. She asked me to contact them, which I did, and ran into the same problem. When I did speak with someone, it was pretty obvious they were not interested in taking him. The next closest facility was about 30 miles away, but in a community I drive through about 3 days a week on my work commute. They sent someone to evaluate him, and their response was that “we don’t think he would be a good fit with our other residents”. At this point, I was beginning to panic. This was not a problem I expected. It never occurred to me that it would be that difficult logistically to place someone in a nursing home. Emotionally, it was devastating. We had hoped that we would be able to care for him at home all the way to the end. My brother still struggles with the decision and the guilt feelings that come with moving your parent into a care facility. To have to make that decision, and then to think that you are not going to be able to find an acceptable one to take them, is just beyond anything I expected to be dealing with. We were just lost on this journey that is Alzheimer’s. I was literally beside myself trying to figure out what we were supposed to be doing or could do during this time. Thankfully, the social worker at the psych hospital kept working on it and a nursing home in the city that I work in about three days a week stepped up and agreed to take him in. By this time it was late May or early June. They were caring and loving towards him, and I just prayed that he would get to stay. And, he did. I would visit every day I was working, and my brother would go and take mom on weekends. His physical decline really accelerated, though, and toward the end of August, his condition took a sudden turn for the worse and it became clear it was time to choose a hospice provider. Hospice care was wonderful, and my Mom, brother and I all were with him when he passed in the wee hours the morning of August 22, 2016, underneath the first quilt I made for him. He treasured it. It is now on a quilt ladder in my hallway where I see it everyday. At first, as sad as I was, it was also a relief to see him freed of his physical prison. He was miserable. After all, we had lost Daddy a long time before his body left this world. It took some time to pass before I could really begin to grieve losing my Dad. Tomorrow marks the first anniversary of his death, and I miss him more than ever. Thankfully, I know that he is once again healed and whole. His sorrow has ended and he rests in peace in the care of our Heavenly Father. It’s not goodbye, it’s so long. I’ll see you later, Dad. If you made it to the end, thank you for taking the time to read. I tried to keep it as short and simple as possible. It was much more complicated and emotional than I can ever put into words here. Life has been sooooo busy. I think about my little blog, and I want to write more in it, but finding the time has not been easy. I will tell you that tonight I started a draft for the post I promised I would write after my father passed away last year after battling Alzheimer’s. I got quite a good start on that post this evening, but it’s going to take a bit longer to write than my normal posts, but at least I have the draft going. For anyone that wants to read it, I plan to have it finished by the first anniversary of his death, which is the 22nd of this month. I warn you, it won’t be short. It will be the longest blog post I’ve ever posted in the 10 years I’ve been blogging here. All that said, I have done some quilting in between the work, housework, family visiting, and caring for my mom in her failing health. Life is full of ups and downs, but I strive to focus on the ups! There is beauty in all of it, and my mantra lately is that my worst days are so much better than many people’s best days, and I must be mindful of and grateful for that! I finished the quilting on another QOV for my guild. The next local QOV presentation put on by our guild, Friendship Quilt Guild, will be in October. I initially agreed to do the quilting on two, which is all they asked of me, but the first two went smoothly and quickly and I easily fit them into my schedule, so I offered to take another one. I truly enjoy participating in this worthy cause. Here’s a little peek. I won’t show the whole quilt since they haven’t been presented yet. I chose Star Swirl panto by Michelle Wyman and Terry Watson. I love it for patriotic quilts. I also love the side lighting in my quilting room in our new home. Also, I have been working on the piecing of Baby Z’s quilt, my newest grandson. I started this quilt just before or just after he was born. He’s almost 10 mos. old now. I must hurry and get this quilt done! Today, I made the blocks for the final row of chevrons, but they are not sewn to each other yet. I also decided the order in which I want to sew the different color rows, and have them laid out in that order. I’m getting so excited to get this top finished and on to quilting! That concludes this Sunday rundown. Stay tuned! I will be back! Have a great week y’all!